Kikuyu MP Aspirant "Chege Fresh" allegedly to be dead after his car was found with bullet holes. - Bana Kenya News, Real African Network Tubanane. 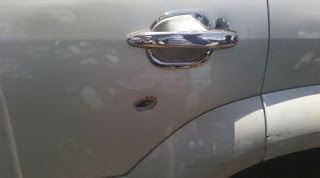 Home Nairobi Kikuyu MP Aspirant "Chege Fresh" allegedly to be dead after his car was found with bullet holes. Kikuyu MP Aspirant "Chege Fresh" allegedly to be dead after his car was found with bullet holes. People injured and one reported Dead when the Kikuyu resident protest against the alleged murder of one of their MP Aspirant. "Chege Fresh " is an aspirant who went missing on Friday after he dropped one of his drivers at the drivers' residence. The aspirant, famously known as Chege Fresh, went missing on Friday night at around 12 pm after he dropped his driver in Kikuyu town ahead of Saturday’s launch of his manifesto. His vehicle was found dumped at Rungiri dam in Gitaru ward with nothing stolen from it according to the Police Police recovered his phones and other personal items unhampered before taking the vehicle to King’eero Police station. His sister Grace Gitau says the family is concerned by the move by King’eero Police Station detectives to move the vehicle from the Scene of Crime before their approval. “We want answers but they’re telling us to go back home, “a visibly worried Gitau said. She last spoke to their 32 years old last born at 7 pm. “He was meeting various youth groups ahead of today’s mega launch of the manifesto,” she said. It is alleged that one of his opponents contributed to the missing. The Kikuyu constituent has a record of MPs or Aspirants getting missing after the Murder of former MP George Muchai.